If you are planning fun and exciting programs for your Scouts to participate in, then the Camp Card program is for you! Camp Cards offer a perfect way for your Scouts to “Earn their own way” to Adventure. The Cornhusker Council is excited to continue the Camp Card Program for Packs, Troops, and individual Scouts. This program is easy to participate in and easy for Scouts and families to support their Scouting activities. Units participating in this program will earn 50% commission ($5) on each $10 Camp Card they sell. Now is the time to commit for your unit to participate in the sale! A unit is responsible for $5 for each card not returned back to the Council Service Center. 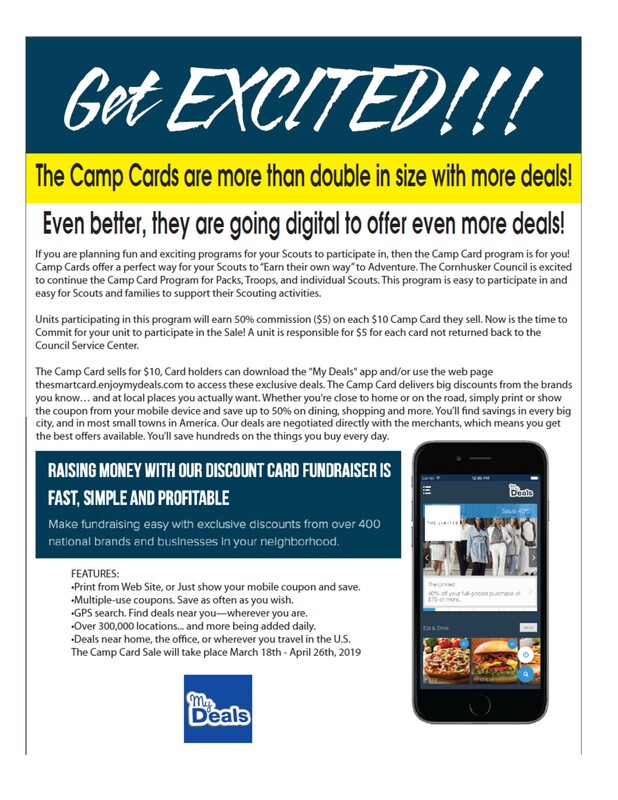 The Camp Card sells for $10, card holders can download the "My Deals" app and/or use the web page thesmartcard.enjoymydeals.com to access these exclusive deals. The Camp Card delivers big discounts from the brands you know…and at local places you actually want. Whether you're close to home or on the road, simply print or show the coupon from your mobile device and save up to 50% on dining, shopping, and more. You’ll find savings in every big city, and in most small towns in America. Our deals are negotiated directly with the merchants, which means you get the best offers available. You’ll save hundreds on the things you buy every day. Print from Web Site, or Just show your mobile coupon and save. Multiple-use coupons. Save as often as you wish. GPS search. Find deals near you—wherever you are. Over 300,000 locations... and more being added daily. Deals near home, the office, or wherever you travel in the U.S. Selling as an individual Scout?